Student season tickets for the 2016 football season go on sale for returning students on Tuesday, April 26. Tickets will be available through May 24 on a first-come, first-served basis while supplies last. Log on at SoonerSports.com/students. Internet ordering will be available 24 hours a day throughout the sale or until tickets are sold out. Student season tickets are $180 apiece. For complete information, please view the 2016 OU Student Football Ticket Policy. To better serve the OU student body, all 2016 football game tickets will be print-at-home or mobile delivery. Students (season ticket holders or individual game buyers) will no longer need to stand in line at the OU Athletics Box Office Monday through Thursday of game week to pick up tickets. OU vs. Texas tickets will continue to be a traditional paper ticket with a pick-up process outlined here. Student season ticket holders will be able to visit a secured website after each home game and log in to receive a free souvenir ticket customized for each home game. More information will follow closer to the season. 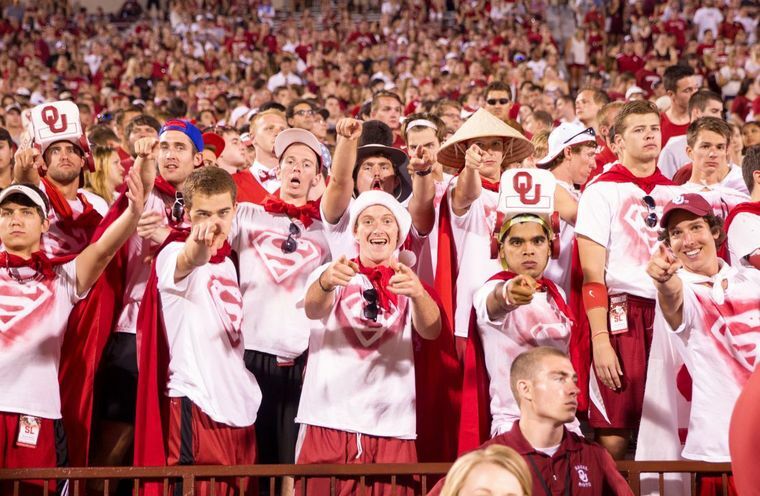 There are 8,000 student football season tickets available in the OU student section. Of these 8,000 tickets, 6,800 will be allocated for sale to the returning students in the spring and summer on-sale periods detailed below. There are 1,200 season tickets allocated for the fall freshmen/new student on-sale period. If demand exceeds supply during this sale, a lottery will be held to determine which students will receive tickets. Returning students who purchase their football season tickets during this sale. Must be currently enrolled full-time student (Spring 2016) at Norman, HSC or Tulsa campus (Full-time: Undergraduates: 12 hours; Graduates: 9 hours) are eligible for this on-sale. Failure to stay enrolled throughout the Fall 2016 semester could result in a forfeiture of remaining tickets. Students that attend OU (Norman, Tulsa or HSC) in Spring 2016, but are transferring to another OU campus (i.e. Tulsa, HSC or Norman) in Fall 2016 are considered Spring Returning Students and eligible for this on-sale. Tickets are first-come, first-served while supplies last. Texas Sale: Category I student season ticket holders will be eligible for OU/Texas tickets when they go on sale September 20th. Category II Students: Returning students that purchase their season tickets after May 24. This on-sale is open to any currently enrolled (Spring 2016) full-time student purchasing remaining tickets after the Spring on-sale has concluded (May 24). Texas Sale: Category II students are only allowed to purchase OU vs Texas tickets after the Category I Student and Category III Student Texas Sale have ended and if supplies last. NOTE: OU/Texas tickets have traditionally sold out on the first day to the spring returning students. Category III Students: New students (Freshmen or transfer) must be enrolled on a full-time basis for the Fall 2016 semester. Students who are transferring from another university (NOT AN OU Campus) are considered NEW STUDENTS if they have never previously attended OU. A lottery to determine, which Category III students will be eligible to purchase season tickets will be held the afternoon of August 23rd if demand for season tickets exceeds supply. Email notification will be sent the evening of Friday, August 23rd on the status of each student's season ticket request. Texas Sale: Category III Students are only allowed to purchase OU vs. Texas ticket if tickets remain from the Category I sale. If tickets are available, they will go on-sale to this group on September 21st. For additional information, please view the 2016 OU Student Football Ticket Policy.